There was nothing special about the Fleetwood trawler Michael Griffith. She was 34 years old and owned by Clifton Steam Trawler Ltd. Trip after trip she ploughed the northern homewaters searching for fish for the nation’s tables. She carried a crew of 13 – including a 16 year old deckie – and was commanded by Skipper Charles Singleton. A stark radio call – “Full of water – no steam – helpless” – signalled the fate of the 286–ton vessel. She vanished – in one of the worst gales recorded – south of Barra Head, West Scotland. It was on Thursday January 29th 1953, that families waved goodbye as the Michael Griffith left port. Everything appeared normal as she headed down the channel at the start of her fishing trip. But a defective feed pump valve caused her to return to port. After repairs the trawler put back to sea. It was Friday January 30th – and she was last seen at 11.10pm by crew of the Fleetwood trawler Aigret. The SOS was picked up on the following day. As other ships, a lifeboat, two planes and a destroyer joined the search the Michael Griffith vanished. In horrendous weather – with hurricane winds – she floundered and went down. Hour after hour the desperate search went on – but all in vain. A few days later two lifebuoys were found near Loch Foyler, Northern Ireland. They bore the trawler’s markings and with their discovery hopes faded. At home, a town in shock once again faced the heartbreak of a fishing tragedy. Thirteen ordinary fishermen going about their dangerous jobs had paid the ultimate price. The close knit community mourned with the bereaved families. Eleven women were widowed and 20 children left fatherless. Teenager George Palin was making his second trip to sea! Crew members were Skipper Singleton, Mate Leonard Grundy, Bosun J T Wilson, Chief engineer Harry Anderson, Second Engineer Thomas Burns, Firemen W Hargreaves and R Bodden, Deckhands J Tucker, S J Johns, J Cryson, C Murdoch and G Palin. Cook was A Bidle. The following year a 3-day Ministry of Transport public enquiry was unable to find the exact cause of the trawler’s loss. It was believed that the exceptionally heavy weather with waves of 30ft was the probable reason. The inquiry was satisfied that the ship was seaworthy, properly equipped and her radio apparatus was in a satisfactory condition. The court also found that the defective value which had caused Michael Griffith to return to port – two days before she was lost – had been satisfactorily repaired. 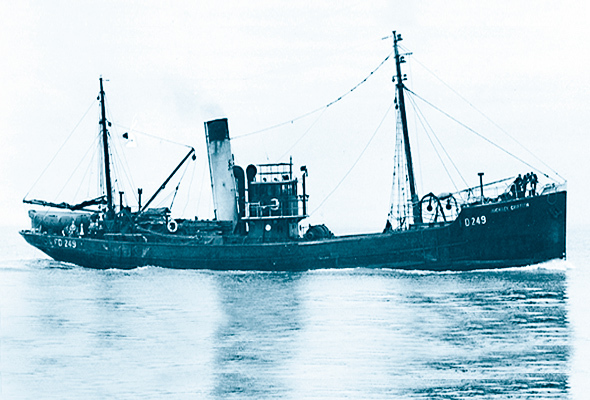 No, there was nothing “special” about the Michael Griffith – just a workhorse of the Wyre port’s trawling fleet. But her tragic loss has earned her and her crew a special place in Fleetwood’s heart – and history. Her crew were of course special – husbands, fathers, sons, brothers, – all “lost at sea”. Three little words which evoke a fearful image which time cannot diminish. Fleetwood has had to come to terms with many maritime disasters – and paid the price for her fishing heritage. Our fishing industry has declined but memories remain and the Michael Griffith and her heroic crew are part of the port’s proud past!